I've decided to launch a fun new regular feature -- the Cover of the Month. On the first of each month I will feature a classic, uncommon, or bizarre bit of James Bond cover art from my personal collection. 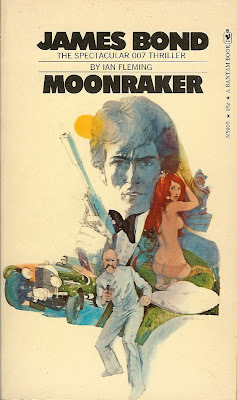 We kick off with a cover for Ian Fleming's Moonraker (click image to enlarge). This is a U.S. paperback edition published by Bantam in 1973. What I like about this cover is it gives the 1955 novel a not-so-subtle 1970s makeover. Dig that hair on Bond, the ruffled tux shirt, and the bell bottoms on Drax! But this is why I collect James Bond paperbacks. I love seeing how the super spy has been repackaged and sold over the years to a new generation of readers. The films have, by in large, remained conservative in their image of 007. But not so with the books, as you will see in the upcoming months. See you in December with a most unique Thunderball.